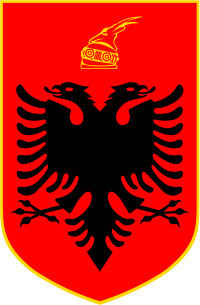 The coat of arms of Albania is similar to the flag of Albania. It is based on the seal of Gjergj Kastriot Skanderbeg. The picture above the head of the two-headed eagle is the helmet of Skanderbeg. The helmet also has billy goats' horns. This page was last changed on 7 October 2018, at 20:11.